Construction/development of the H&BT Rail Trail is completed. As of June 30, 2016 the entire 10.6 miles of trail between Riddlesburg and Tatesville is open for your enjoyment. The H&BT Rail Trail project is the development of a former railroad right-of-way into a rail trail for public use. The entire property, owned by Broad Top Township, includes 10.6 miles of the Huntingdon and Broad Top Mountain Railroad right-of-way. The trail will encompass from the north end of Riddlesburg south along the bank of the Raystown Branch of the Juniata River to Cypher and then overland away from the river to Tatesville. The standard gauge Huntingdon and Broad Top Mountain Railroad (H&BT) was chartered on May 6, 1852, for the purpose of developing and transporting semi-bituminous coal from the Broad Top Mountain and Coal Field situated in the corners of Huntingdon, Bedford and Fulton Counties of south-central Pennsylvania. Although small “country coal mines” existed around the mountain prior to the chartering of the H&BT, coal mining and railroading company officials needed a reliable mode of transportation to get the “black diamonds” to eastern markets, thus the construction of the H&BT. By the end of 1855, 24 miles of the H&BT main line had been opened with trains in service from Huntingdon to Saxton, where the Shoup’s Run branch line was extended to Dudley to tap coal mines in that area, and later to Broad Top City. The Stonerstown/Saxton area quickly became the nerve center of the railroad followed by the completion of the main line to Hopewell in the summer of 1856, a distance of an additional seven miles. 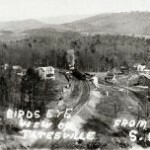 As branch lines were opened from Riddlesburg up the Six Mile Run Valley and from Hopewell up Sandy Run and Long’s Run to tap the area coal mines, planning for the extension of the main line to Bloody Run (Everett/Mount Dallas) and Bedford began. The 13-mile H&BT main line from Hopewell to Everett was opened for service in June of 1862 (originally proposed by the insolvent Bedford Railroad Co., and taken over by the H&BT). With an eye on the Western Maryland Coal Field (Cumberland, Mt. Savage, George Creek region) the H&BT, through a series of agreements with the new Bedford and Bridgeport (present day Hyndman) Railroad (B&BRR), increased its coal traffic and passenger service. The H&BT also transported visitors from Huntingdon and the Broad Top to the Bedford Springs Resort via the Everett-to-Bedford route which later became the Bedford Division of the Pennsylvania Railroad. By the end of the Civil War, the original railroad repair shops at Hopewell (Keystone Foundry and Machine Shop erected in 1857) had been relocated to Saxton as plans unfolded for the erection of the Riddlesburg Iron Furnace and coke ovens operation in 1868. 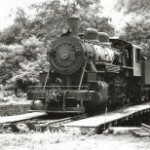 During the years that followed, the H&BT benefited from revenue generated by the coal mining iron-making and agricultural industries and passenger and U.S. Mail service. 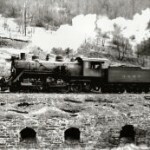 With the construction of the B&BRR in 1872, the H&BT benefited from a convenient “bridge run” between the Western Maryland Coalfield and Huntingdon which propelled the H&BT into its long running “glory years.” Those prosperous years came to and end in 1908, when the PRR opened a competing line between Bedford and Claysburg in Blair County. Coal mining peaked on the Broad Top around World War I and by the end of World War II new forms of energy had dethroned King Coal. 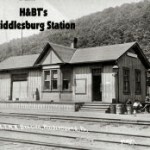 During the late 1940s the H&BT went into receivership and attempts to save the railroad during the early 1950s failed. The H&BT went out of existence on March 31, 1954, and the main line between Cypher Bridge and Huntingdon was scrapped in the spring of 1954. The main line between Cypher and Mount Dallas remained intact and on April 1, 1954, the new Everett Railroad Co. began freight service between Tatesville and Everett (including a short-lived tourist railroad operation during the 1960s). The operation lasted until the 1980s when the old Bedford Division of the PRR was scrapped and the Everett Railroad Co. relocated to Blair County. The remaining H&BT rails between Tatesville and the Cypher Bridge were torn up in the Spring of 2008.